Chain of events lead to Independent Party of Oregon candidate's endorsement of governor who agrees to push campaign finance reforms. On Sunday evening, Patrick Starnes, a cabinetmaker and would-be governor, hit "send" on his home computer, dispatching an email that triggered events that would jolt Oregon's close governor's race. Within 48 hours, he abandoned his long-shot bid for office, lined up behind Gov. Kate Brown's bid for re-election and pointed an accusing finger at Republican Knute Buehler for taking millions from wealthy donors. Those actions moved to center stage of Oregon politics the one issue that the former school board member cared about — limiting money flowing to Oregon politicians seeking public office. His late move, coming just days before votes will be counted, leaves an uncertain imprint on voters. Polls show Brown, the incumbent, leading Buehler — but not by much. Her very public embrace of Starnes helped ensure that campaign finance becomes one of the hot topics in the final days of the campaign. "We can all agree there is way too much money being spent on campaigns," Brown said. "I think we now have a huge incentive to change the system." Buehler's campaign dismissed the political realignment as just "one tax-and-spend liberal endorsing another tax-and-spend liberal." And Starnes' party quickly distanced itself from his actions. "To the people who may have already voted for him, we apologize," the party said in a tweet Tuesday evening. "We disagree with how he handled his decision. Our party does not endorse" Brown. Starnes exits the political stage as an everyman, the nominee of the Independent Party of Oregon who drove himself from one campaign appearance to another, often alone. He criss-crossed the state pushing his message that money is messing with Oregon politics. He accepted no donation of more than $100, and fought to share the stage with Brown and Buehler, the polished professionals. He made it into one debate, but had no seat at two others. About a week ago, Starnes was home filling out his ballot and thought about the similarities between his platform and Brown's. "I realized the big difference between us was campaign finance reform and I needed to talk about campaign finance reform with her," Starnes said. He crafted an email to Christian Gaston, the spokesman for Brown's campaign who struck a rapport with Starnes after his only debate appearance. In his email sent at 5:57 p.m., Starnes wrote: "Christian, I know we have less than 10 days before the big day. Would it be possible for you to set a meeting with me and the governor?" He signed it, "optimistically, Patrick Starnes." Brown learned about the message the following day and agreed to meet. On Tuesday, the two candidates separately drove to Southeast Portland, to a labor union office near Cleveland High School. They met alone in a room, without aides, discussing the need to reform campaign finance laws. The governor agreed to push for such reform, but the two didn't settle on specifics. At the end of the 40-minute meeting, Starnes surprised the governor with his decision: he would end his campaign and support hers. 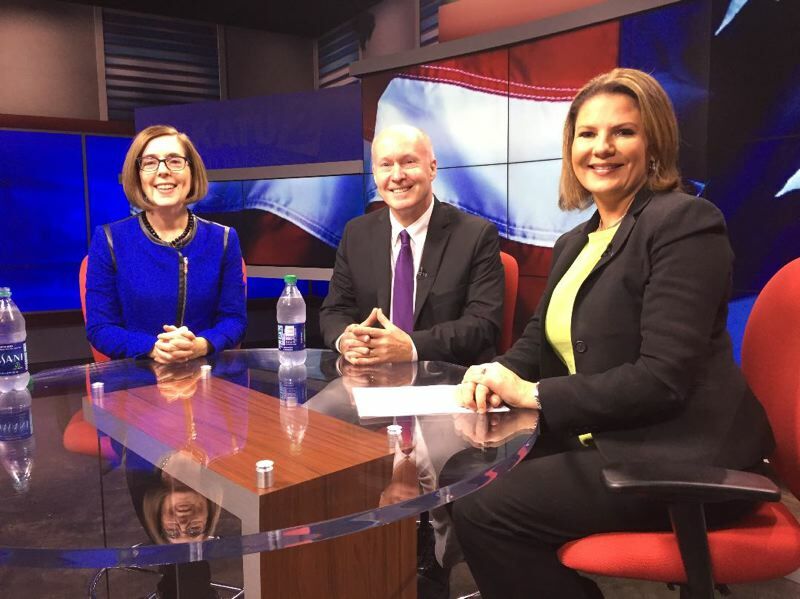 They decided to announce the decision at Portland television station KATU, where Starnes had a previously scheduled an appearance set for 11 a.m. To fit in the surprise move, Brown canceled time scheduled with U.S. Sen. Ron Wyden for a "get-out-the-vote" effort. Brown told the Oregon Capital Bureau that while she didn't strike a deal with Starnes, she was committed to getting a constitutional amendment on the ballot to more heavily regulate how campaigns are funded. She said that could either be done through the Legislature or working with a coalition for a petition to get it directly on the ballot. Besides capping contributions, Brown said she and Starnes were concerned about the dark money in elections. Dark money comes from outside groups not directly related to campaigns that don't have to disclose where their money comes from and goes until after the election. Brown said she doesn't have specific caps for contributions in mind. Those decisions would be made after the election, but Brown said Starnes would be a part of her process. "He obviously knows that I have been committed to campaign finance reform," Brown said. "Both of us feel strongly that we are seeing a groundswell. We have an incredible opportunity for us to move forward over the next couple of years on this issue if we can work together." "I thought he was a breath of fresh air," she said. "I appreciate his practical sense of public policy and his hands-on experience." Starnes said in a separate interview that Brown has accepted fewer large campaign donations than Buehler, a Bend surgeon. This year's gubernatorial race — to be decided in a week — is the most expensive in Oregon history. Combined, Brown and Buehler have raised nearly $30 million. Starnes said another reason he decided to favor Brown was Buehler's decision to accept $2.5 million in contributions from Nike co-founder Phil Knight. "I feel like those common donations that other folks give to Gov. Brown are better than the multimillion-dollar donations from one individual," Starnes said. "You can't have one person buying a governor. We want many people to support our governor." Jordan Conger, Buehler's policy director, said the Republican nominee has been a long supported campaign finance reform. "He supports reform but believes we should focus on ideas that will pass the legal scrutiny of the courts," Conger said. "The possibilities of what will pass legal muster are now much more limited." He cited a U.S. Supreme Court decision from 2010 — Citizens United v. the Federal Election Commission — that unleashed spending, by corporations on candidate election campaigns. Buehler, along with state Rep. Dan Rayfield, D-Corvallis, last year proposed legislation that would have convened a task force to consider how to discourage independent expenditures — campaign contributions from outside groups not associated with a candidate. The legislation mimicked the People's Pledge in Massachusetts, an agreement by Sens. Elizabeth Warren and Scott Brown in 2012 to reject money from outside groups, or pay a penalty. Starnes' announcement comes nearly two weeks after voters received their ballots. By Tuesday, nearly 600,000 Oregon voters had turned in ballots. That represents about one-fifth of the state's nearly 2.8 million eligible voters. About 28,000 of the ballots came from voters registered with the Independent Party of Oregon. Another 100,000 of the ballots came from nonaffiliated voters. Brown has supported campaign finance reform for a decade. The Independent Party – Starnes' party – endorsed her in her successful 2008 run for secretary of state on the promise she would support limits on campaign donations. She pursued that idea but dropped it in the face of opposition from Democrats. "I think she's basically made the same promise to Patrick that she made to us when she was running for secretary of state," said Sal Peralta, secretary of the Independent Party of Oregon. "Even though she made a good faith effort to address our concerns for about a year, she then threw up her hands. She has consistently said she is committed to campaign finance limits, but I have never seen any action." Starnes thinks this time will be different. After the record-breaking individual contributions to Buehler's campaign, Starnes said, Brown seems motivated to push the reforms. He noted that if she wins re-election, she would be in her final term as governor and likely more willing to take political risks. Reporter Claire Withycombe of EO Media Group contributed to this report. They are work for the Oregon Capital Bureau, a collaboration of EO Media Group, Pamplin Media Group and Salem Reporter.